vol. 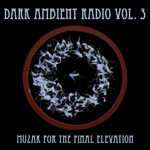 3, also called "muzak for the final elevation", is, again, full of calm droning cinema music. great piece to learn about a few long term active musicians and many new ones emerging within the last years. no tracks to highlight here, it's a well balanced full time soundtrack for your own thoughts and activities. may they be sinister and obscure. recommended, especially for doing something meanwhile, i just never wanted to know who is who.